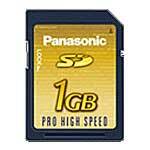 Panasonic is developing a technology to record digital HD (high-definition) images onto SD Memory Cards, following the AVCHD standard for HD digital video cameras. This new HD video recording technology for SD Memory Cards will conform to the AVCHD standard, which uses a highly efficient compression encoding technology to record 1080i*1 or 720p*2 HD images onto 8-cm DVD discs. It will use MPEG-4 AVC/H.264 to compress video files, and Dolby Digital (AC-3) or Linear PCM for audio files. This combination makes it possible to develop HD video cameras that are compact yet deliver high-quality images and sounds. “Believing that the SD Memory Card is the recording media best suited for video cameras, Panasonic has already released a professional-use HD video camera that uses SD Memory Card technology”, said Mr. Akihiro Nakatani, Director of Video Camera Business Unit, Panasonic AVC Networks Company.